Eat your way through downtown and see where Vegas first began. Discover the city’s up & coming trendy local scene & visit top attractions on world-famous Fremont Street on this fun, casual food tour in Downtown Las Vegas. This walking tour of downtown was really great! After taking a group pic, we were off. Seven stops later, we were full and happy we took this tour. Our tour guide was MAGNIFICENT. From beginning to end, this tour was enjoyable and I would most definitely recommend it. Had been in downtown Vegas before but never stumbled on any of the places we visited. Many hidden gems, great comfort foods!!! Highly recommend. Our Downtown Las Vegas food tour will take you through the major areas of “Old Vegas” to discover where the city first began. Your Foodie Foodie Friend will walk you down world-famous Fremont Street to see all the glitz and glamour of Fremont Street Experience. You will also venture off the beaten path to discover all the local favorite hangouts away from the hustle and bustle of the main tourist attractions. On this tour, you’ll visit 7 different foodie spots and indulge in one or two tastings at each location. Starting on Fremont East, you’ll stroll through Container Park, a local’s favorite, and learn about the revitalization of Downtown. 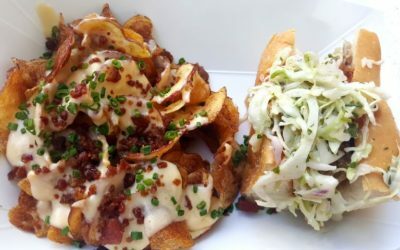 You’ll end the tour at another local favorite spot, sampling creative bites from small businesses, family-owned restaurants, and a food truck along the way. You’ll get the best of both worlds on this complete downtown tour of food tastings, sightseeing, history, and local culture. 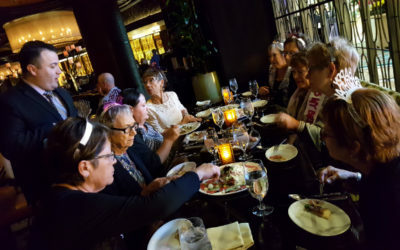 The Downtown Delights Foodie Tour will finish just in time for you to join the excitement starting to unravel just as the sun goes down in Vegas. *For more information, please visit our FAQ page. 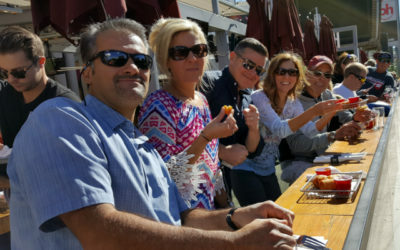 Reserve your Taste Buzz Food Tour today!